Rosacea is a skin disease that causes redness, vasodilation and bumps on the face, called papules. In some cases, it can affect the eyes as well. When it does, it’s called ocular rosacea. About 13 million Americans have rosacea, mostly adults older than age 25. More than half of these individuals have ocular rosacea. Some people only have ocular rosacea and lack the other facial findings, although this is rare. Ocular rosacea can cause red, injected eyes, burning and swollen eyelids.The eyes also may appear bloodshot and sting or feel sore. A prominent sandy or foreign body sensation may also be present. Fans, heating vents or air-conditioning may cause the eyes to water due to excessive tear evaporation. Ocular rosacea may result in light sensitivity and blurred vision when severe. Researchers have found that 85% of people with ocular rosacea have blocked oil glands around the edges of their eyelids. These glands, called Meibomian glands, produce the oily layer of the tear film that prevents tear evaporation, thereby preventing eye dryness. If they are blocked, the lid margins may swell and get irritated. This can lead to redness and burning in the eyes and crusting on the eyelashes. Recent research indicates Demodex mites, tiny spider-like creatures (Acarids) that live in hair and lash follicles and oil glands of the face and eyelashes, are involved in the process that results in Rosacea. Others think there may be a link between rosacea and the bacteria in the gut that cause ulcers and malabsorption. Rosacea may also result from a problem with blood vessel function. Genetics and environment also may play a role in rosacea severity. 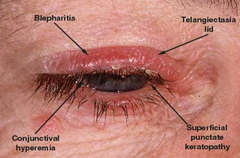 Demodex mites on the eyelid margins of individuals of Nordic, Anglo-Saxon, Slavic and other northern European extractions carry bacteria on their exoskeletons that may cause eruptions of the skin lesions and the eye findings seen with Rosacea. Although the disease itself can’t be spread from person-to-person, the Demodex mites can be, and therefore the disease process in theory may be communicable. 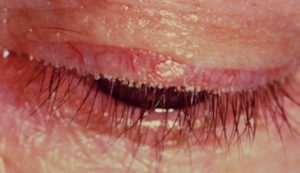 Treatment may involve lid cleaning with specialty lid cleansers, Acaridocidal agents, applying hot moist compresses to the eyelids and compression of the eyelid margins to help express oils from obstructed Meibomian glands, as well as to expel mites. “Probing” is a newer treatment during which the doctor puts thin rods into the plugged glands to open them up. Doctors also often recommend oral or topical antibiotics or other topical agents to help with the symptoms, or prescribe eye drops or ointments with steroids for the irritation and redness. Artificial tears can help keep the eyes stay moist. If neglected, severe ocular rosacea can cause vision threatening problems, even blindness. 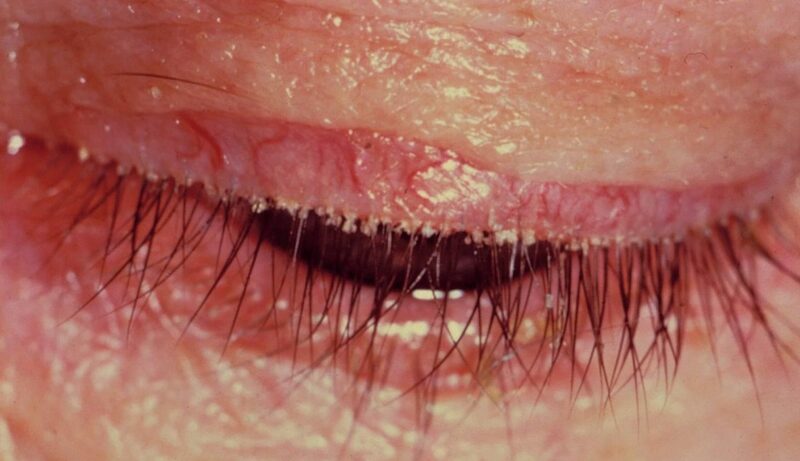 There can be scarring of the glands in the lid margin, mechanical defects or damage to the cornea. Chronic dry eye is a frequent finding in such cases. Wear glasses or sunglasses to shield the eyes from sun and wind when outside. Keep the face clean, especially around the eyes. Dr. Vale may tell you to put warm compresses on the eyelids several times a day or to gently wash the lashes and lids with a special lid cleanser. Take medications for the condition as directed. Make sure to follow your doctor’s orders to the letter to prevent symptoms from getting worse. If they do get worse, inform the doctor right away. ← How Does Diabetes Damage The Eye?